Chris Detrick | The Salt Lake Tribune Lt. Governor Spencer Cox listens during a 'Stop to Talk, Stop to Text' safety initiative press conference in at Staker Parson Paving in Draper Thursday June 2, 2016. Chris Detrick | The Salt Lake Tribune Lt. 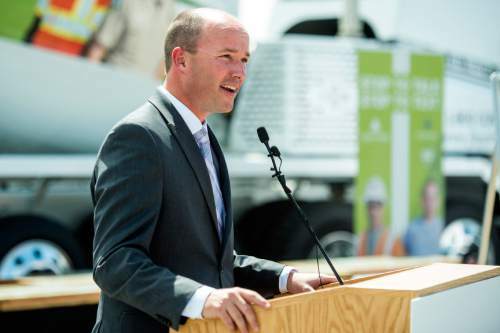 Governor Spencer Cox speaks during a 'Stop to Talk, Stop to Text' safety initiative press conference in at Staker Parson Paving in Draper Thursday June 2, 2016. Chris Detrick | The Salt Lake Tribune Lt. Governor Spencer Cox listens during a 'Stop to Talk, Stop to Text' safety initiative press conference in at Staker Parson Paving in Draper Thursday June 2, 2016. 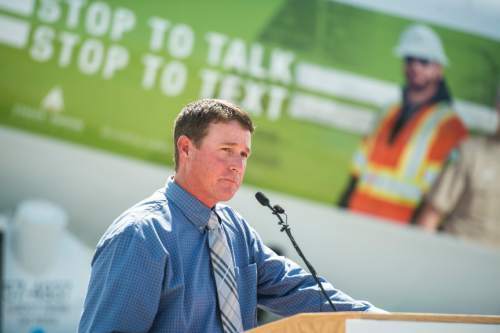 Chris Detrick | The Salt Lake Tribune Staker Parson Companies CEO Scott Parson speaks during a 'Stop to Talk, Stop to Text' safety initiative press conference in at Staker Parson Paving in Draper Thursday June 2, 2016. 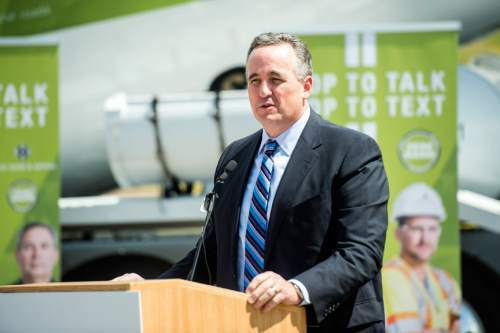 Chris Detrick | The Salt Lake Tribune Staker Parson Companies CEO Scott Parson speaks during a 'Stop to Talk, Stop to Text' safety initiative press conference in at Staker Parson Paving in Draper Thursday June 2, 2016. 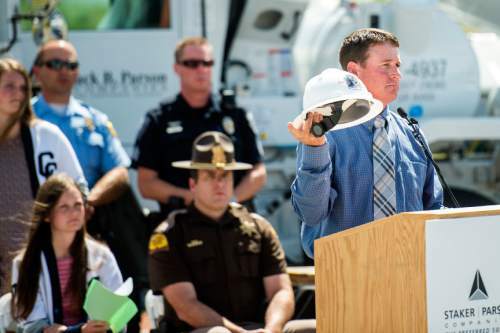 Chris Detrick | The Salt Lake Tribune Lee Goodrich speaks about his nephew Chet Goodrich, who was killed a year ago by a distracted driver, during a 'Stop to Talk, Stop to Text' safety initiative press conference in at Staker Parson Paving in Draper Thursday June 2, 2016. 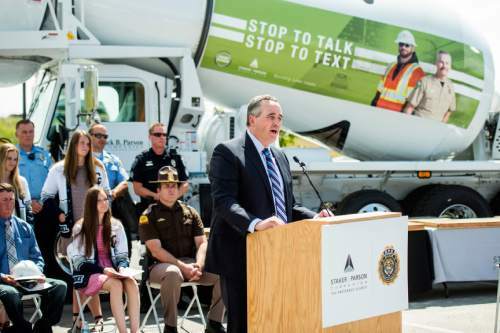 Chris Detrick | The Salt Lake Tribune Lee Goodrich speaks about his nephew Chet Goodrich, who was killed a year ago by a distracted driver, during a 'Stop to Talk, Stop to Text' safety initiative press conference in at Staker Parson Paving in Draper Thursday June 2, 2016. Chris Detrick | The Salt Lake Tribune Lt. Governor Spencer Cox speaks during a 'Stop to Talk, Stop to Text' safety initiative press conference in at Staker Parson Paving in Draper on Thursday. 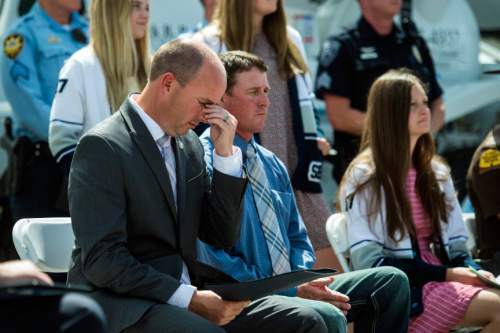 Chris Detrick | The Salt Lake Tribune Lt. 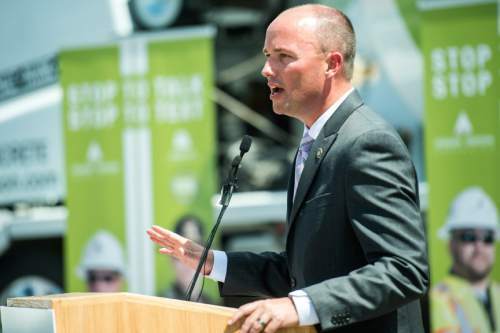 Governor Spencer Cox speaks during a 'Stop to Talk, Stop to Text' safety initiative press conference in at Staker Parson Paving in Draper Thursday June 2, 2016. State officials joined Staker Parson Cos. on Thursday to launch a new effort to eliminate distracted driving, especially by use of cell phones. The new program, "Stop to Talk. Stop to Text," encourages drivers who need to talk or text to find a safe place to stop to carry out their conversation. Staker Parson has used that for its truck drivers and other employees. 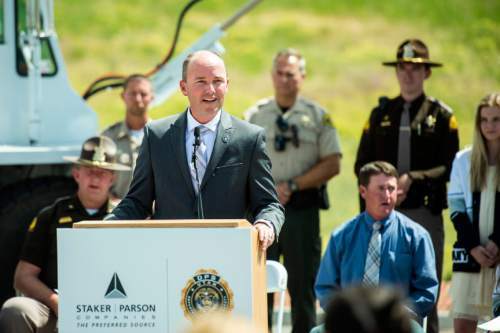 "We aim to extend this safety stewardship from our greatest asset  the employees  to all Utahns by motivating them to avoid distracted driving, particularly from cell phone use, while behind the wheel," said Scott Parson, CEO of Staker Parson. Lt. Gov. 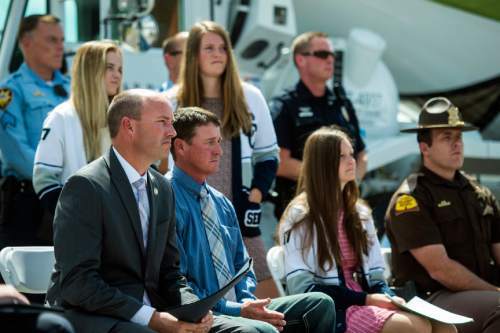 Spencer Cox said, "We implore all Utahns to remember that every distracted driving incident is preventable."